Introduction: Among the United Arab Emirates (UAE) population more and more people now consider travelling abroad. This is potentially problematic because travelling enhances exposure between hosts and pathogens and so people that travel are putting their health at risk. This concern makes it necessary that public education is provided to inform people of the risks of travelling abroad so that such risks can be minimized. Guidelines and advice on travelling abroad are available and easily accessible but several studies have shown that travellers do not always follow such advice. In this study, the aim was to look into the practices and attitudes of UAE residents in relation to prevention of travel-related infectious diseases. Methods: A cross-sectional study was conducted from February to April 2015, in different emirates of the UAE. A self-administered anonymous questionnaire was developed based on material acquired from similar studies. The methodology applied quota sampling whereby adults above the age of 18 who’d travelled abroad in the past year were chosen from the seven emirates. The number of participants selected from each emirate was proportionate to the population size of each state. Results: A total of 385 questionnaires were completed. A remarkable 70% of respondents indicated that they had not taken on any precautionary measures prior to travel. Of greater interest was that only 21% of participants had taken advice on health prior to travel, while the outstanding majority 79% reported that they had not taken advice. The most common source of advice had been taken from family and friends among those who had taken advice at 41%, while only 15.4% had acquired it from specialized travel medicine clinics. High risk perception, spending more preparation time and travelling for longer durations were important factors that encouraged pretrial health consultation and undertook preventive measures. Conclusion: This study revealed that UAE residents had not taken adequate measures to prevent travel related infectious diseases. Despite the limitations of this study, it still provides sufficient data to improve public health intervention directed at encouraging travellers to acquire pre travel health consultation. Baer A, Libassi L, Lloyd JK, Benoliel E, Brucker R, Jones MQ, et al. Risk factors for infections in international travelers: an analysis of travel-related notifiable communicable diseases. Travel Med Infect Dis. 2014;12(5):525-33. Gezairy HA. Travel epidemiology: WHO perspective. Int J Antimicrob Agents. 2003;21(2):86-8. Hanif N. More people opting to leave UAE on summer breaks: The National; 2013 [2013, July 1]. Available from: http://www.thenational.ae. Horby PW, Pfeiffer D, Oshitani H. Prospects for emerging infections in East and southeast Asia 10 years after severe acute respiratory syndrome. Emerg Infect Dis. 2013;19(6):853-60. Prevention CfDCa. Travel Health Notices 2014 [2014, November 13]. Available from: http://wwwnc.cdc.gov/travel/notices. Van Herck K, Van Damme P, Castelli F, Zuckerman J, Nothdurft H, Dahlgren AL, et al. Knowledge, attitudes and practices in travel-related infectious diseases: the European airport survey. J Travel Med. 2004;11(1):3-8. Prazuck T, Semaille C, Defayolle M, Bargain P, Clerel M, Lafaix C, et al. [Vaccination status of French and European travelers: a study of 9,156 subjects departing from Paris to 12 tropical destinations]. Rev Epidemiol Sante Publique. 1998;46(1):64-7. Dahlgren AL, DeRoo L, Steffen R. Prevention of travel-related infectious diseases: knowledge, practices and attitudes of Swedish travellers. Scand J Infect Dis. 2006;38(11-12):1074-80. Memish ZA, Al-Tawfiq JA, Assiri A, Mohammed M, Bamgboye EA, Alhakeem R. Epidemiology of mumps and rubella in the Kingdom of Saudi Arabia: 2009-2011--Implications for immigration and travel. Travel Med Infect Dis. 2015;13(3):261-2. Authority FCaS. 2014 [2010, December 25]. Available from: http://www.fcsa.gov.ae. Toovey S, Jamieson A, Holloway M. Travelers' knowledge, attitudes and practices on the prevention of infectious diseases: results from a study at Johannesburg International Airport. J Travel Med. 2004;11(1):16-22. Hamer DH, Connor BA. Travel health knowledge, attitudes and practices among United States travelers. J Travel Med. 2004;11(1):23-6. Wilder-Smith A, Khairullah NS, Song JH, Chen CY, Torresi J. Travel health knowledge, attitudes and practices among Australasian travelers. J Travel Med. 2004;11(1):9-15. Yoo YJ, Bae GO, Choi JH, Shin HC, Ga H, Shin SR, et al. Korean travelers' knowledge, attitudes, and practices regarding the prevention of malaria: measures taken by travelers departing for India from Incheon International Airport. J Travel Med. 2007;14(6):381-5. Al-Hajri M, Bene A, Eljack I, Balbaid O. Travellers Knowledge, Attitudes and Practices on the Prevention of Infectious Diseases: Qatar-Doha International Airport Study. Middle East J Family Med. 2011;9(9). Al-Abri SS, Abdel-Hady DM, Al-Abaidani IS. 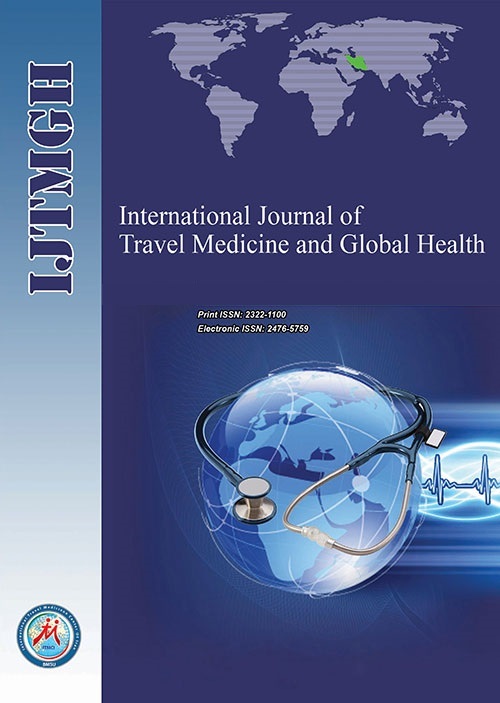 Knowledge, attitudes, and practices regarding travel health among Muscat International Airport travelers in Oman: Identifying the gaps and addressing the challenges. J Epidemiol Glob Health. 2016;pii: S2210-6006(15):30123-4. Chen CM, Tsai JS, Chen SH, Lee HT. Knowledge, attitudes, and practices concerning infection control among travelers between Taiwan and mainland China. Asia Pac J Public Health. 2011;23(5):712-20. Grabowski P, Behrens RH. Provision of health information by British travel agents. Trop Med Int Health. 1996;1(5):730-2. Keystone JS, Kozarsky PE, Freedman DO. Internet and computer-based resources for travel medicine practitioners. Clinical infectious diseases : an official publication of the Infectious Diseases Society of America. 2001;32(5):757-65. Provost S, Gaulin C, Piquet-Gauthier B, Emmanuelli J, Venne S, Dion R, et al. Travel agents and the prevention of health problems among travelers in Quebec. J Travel Med. 2002;9(1):3-9.